Our Neato D80 Review will examine all aspects of this robotic vacuum cleaner. 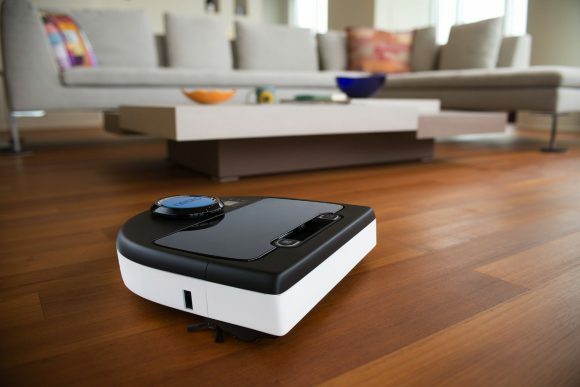 This autonomous vacuum is one of the best units we’ve reviewed to date. 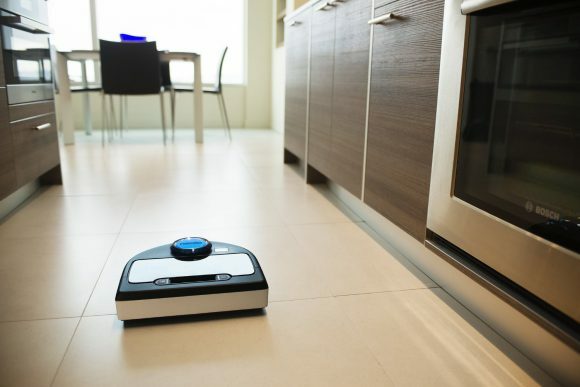 It’s ability to accurately map your living space makes it one of the most efficient robot vacuums out there. The Botvac D80 is a phenomenal all around vacuum but is specifically engineered for tougher tasks like excessive pet hair. Homes with pets and allergy sufferers have seen drastic improvement in their living situations. This robot vacuum includes a 1 year warranty from Neato. 2 and 3 year extended protection options are also available from Amazon. Now let’s get into some of this vacuum’s features. The D80 uses Neato’s LaserSmart technology to map your home’s floors. This allows it to map your rooms and detect objects in them rather than aimlessly bumping around in hopes of cleaning everything. 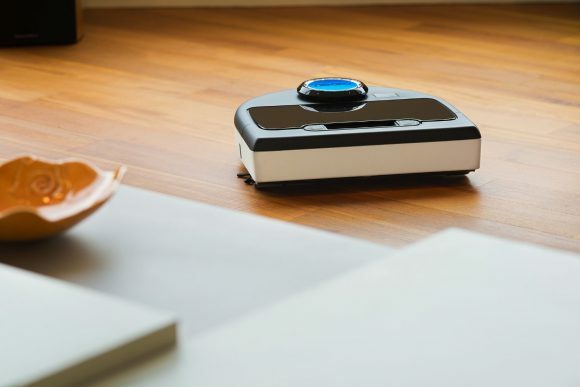 Neato claims that this technology results in the D80 cleaning your living area up to 4 times faster than other robot vacuum cleaners. 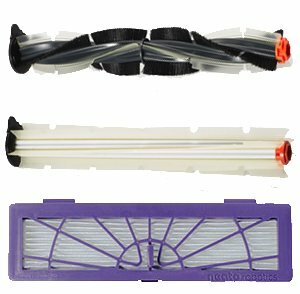 Neato’s SpinFlow system in the D80 uses a combination of brushes and suction to lift dirt and debris off your home’s floors. The unique “D” shape of this robot vacuum coupled with its CornerClever technology allows it to get into corners and along walls much closer than other robot vacuums. A 7 day programmable schedule is integrated into this robot vacuum. The user simply selects the days and times for cleaning using the Auto-Schedule display screen located on the top of the unit. There is also a Start button to begin an unscheduled cleaning. The Botvac D80 includes a charging base where its battery is automatically refilled. Once the D80 is running low on battery, it will return to its base, recharge, and resume cleaning from where it left off. Sensors on this robot vacuum tell it when it is nearing a staircase. This allows the D80 to safely turn around so it doesn’t get damaged. Boundary Markers are included with this unit. These markers are used to prevent the D80 from going into rooms you don’t want vacuumed. 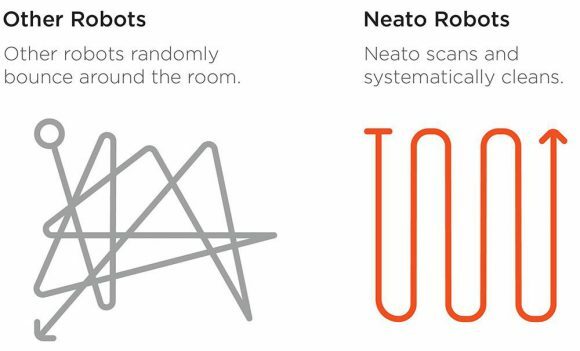 Neato claims that its brush is 50% larger than other robot vacuums because of its “D” shape design. This allows it to get within 10 millimeters of walls. Its low profile also ensures that it can get beneath your household furniture with ease. The D80 uses a .7 liter dirt bin to collect debris. Neato claims that this is larger than its circular robot rivals. The bin is removed from the top of the robot rather than the side or bottom as seen with other robotic vacuum cleaners. This makes for clean and seamless bin removal. This vacuum cleaner also does a great job at lifting all types of hair from the floor. Neato states that the D80 can pick up more hair than any of its competitors. This unit includes a Spiral Blade Brush which is good for all types of flooring, a Combo Brush which is great for hair and has a lower operating volume, and 2 high performance filters to trap dust. The Neato Botvac D80 measures 13.2″ wide by 3.9″ high by 12.7″ deep and weighs 9 lbs. 77% of Amazon purchasers give the D80 a 4 to 5 star rating. 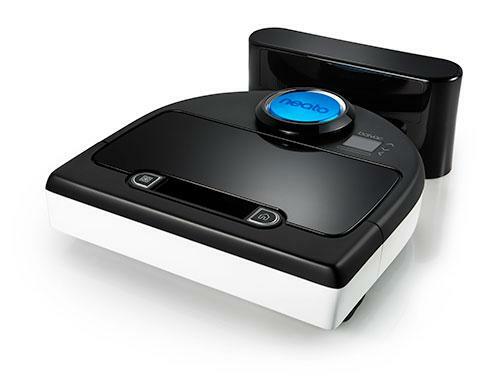 People claim that this robot vacuum picks up a significant amount of hair and debris from their floors. They are astonished every time they empty the bin. Operating volume was noted to be very low. User didn’t find that this vacuum was overly noisy or annoying to be around while it was roaming their homes. Allergy sufferers have noticed that their symptoms have been significantly reduced. The D80 gets into corners and beneath objects where allergens tend to accumulate. One of the main benefits people cite is its gentle operation. It doesn’t harshly bump into walls, rather it detects when its nearing a wall or object and slows down to get as close as possible to it. Those who have owned this vacuum and the XV-21 state that the D80 is a drastically improved model. They find that it is able to get their floors much cleaner and doesn’t get hung up on things nearly as often. The dirt bin is also much larger which means it doesn’t have to be emptied as often. The Neato Botvac D80 is a wonderful autonomous vacuum cleaner. It has tons of great technology which enable it to clean efficiently, quietly, and gently. This robot vacuum’s size and shape allow it to get into tight spaces and beneath objects. We love the “D” shape design and how it can get into corners and clean walls better than other robot vacuums we’ve reviewed. 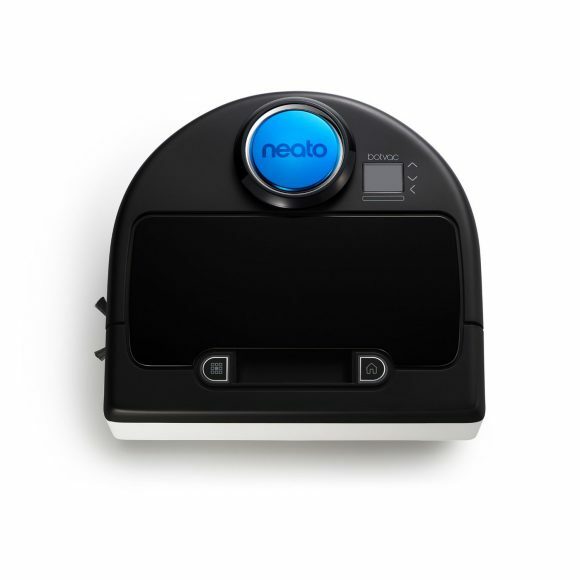 Neato has been doing a great job with their robot vacuum products and the D80 is just another testament to that. When weighing your options for a robot vacuum, keep the D80 at the top of your list! We hope you enjoyed our Neato D80 Review. Please feel free to share or leave comments below! The fact that you emphasized on how good it is with dog hair is a plus for us dog owners. 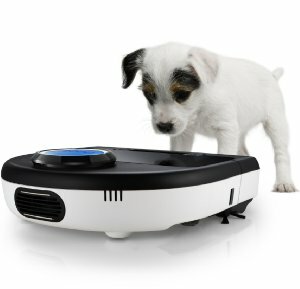 Absolutely, this robot vacuum is a welcomed addition to households with dogs. It will make your life much easier! The Neato D80 sounds really efficient. We have an Australian Cattle Dog who sheds like crazy. And her hair ends up lining the rooms where we have hard wood floors. Love that the Neato D80 gets within 10 mm of the wall. And the shape makes it more suitable to the way rooms are built with corners and lots of straight edges. I have friends with earlier, circular models and this sounds so much better! No more pulling the vacuum cleaner and hoping the hose attachment reaches all of those hard-to-get places underneath furniture. Great review. I’m intrigued! This vacuum would be a prime candidate for your household! It does a wonderful job and removing pet hair and gets very close to walls. The D shape design is ingenious. Best of luck! Thanks for this informative Neato D80 Review. I’ve been thinking about buying this vacuum and your review hit on many of the positive aspects. I like how its shape helps vacuum better than circle vacuums. It got really good reviews and I think it is the right fit for my home! This will save me lots of time in the long-run. I also like how I can choose when it will vacuum. I want it to do so when I’m at work during the day. These robots are awesome! These robot vacuums definitely make life a lot easier in the cleaning department. The design of the D80 is a huge benefit compared to its circular counterparts like the iRobot. You won’t be disappointed with this vacuum cleaner. Good Luck!